During absence seizures, the person will often appear to be just staring off into space. There is no typical jerking or twitching as is associated with many other types of seizures. 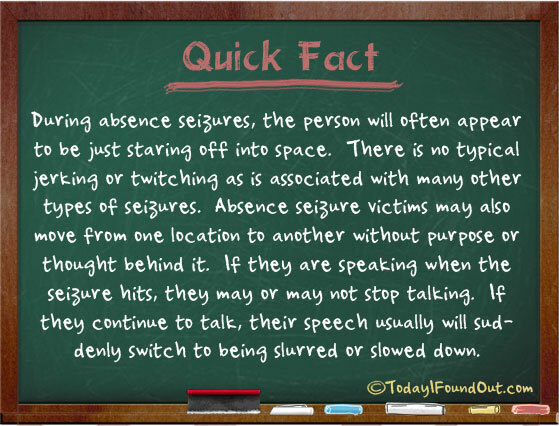 Absence seizure victims may also move from one location to another without purpose or thought behind it. If they are speaking when the seizure hits, they may or may not stop talking. If they continue to talk, their speech usually will suddenly switch to being slurred or slowed down. any info at all is informative. 10 years ago, doctors didn’t even have a name for absence seizures and those were the few who actually knew about petite mal seizures. One doctor out of 20 in 10 years may have been even close to the mark. what has happened to our educational system. people need help and knowledge.